Airtel has been sending up a SMS to its pre-paid customers about the announcement of SMS Bonanza. Before I really explain the Bonanza let me give you the basic details. 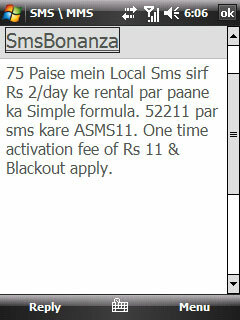 It says that the user will be able to send local SMSes at 75 paise with a rental of Rs. 2/day which will be deducted from the available balance. As with any other SMS scheme, the Blackout dates are applicable to this one also. There is a one-time activation fee of Rs. 11 which will be deducted after you send ASMS11 to 52211. So let’s unveil the real bonanza. You must be knowing about the SMS packs which Airtel offers in denominations of Rs. 11, Rs. 48 and Rs. 102. I generally refill my SMS pack with Rs.48 which gives me 150 SMS/month but let us assume that this time I go for the SMS Bonanza. If you do the math excluding the cost of sending SMSes, it has already exceeded my expensive for me. Now including all the charges of rental, message charges (and one-time activation fee), my monthly expenditure comes to Rs. 183.5 (Rs. 2 X 30 days + Rs.11 + Rs. 0.75 X 150). Now that’s f****** expensive! No doubt, Airtel will find takers for this scheme as 75 paise/SMS is lucrative compared to Rs. 1.50/message but if you calculate the actual cost of one message sent in this scheme, then it comes to Rs. 1.15/SMS. It is advantageous to those who have loads of unused prepaid balance in their account. But I would recommend to save that balance for any other thing instead of donating it to your beloved operator. withot any rental and there is no Blackout. So Air Tel’s this offer is not valuable for any news or sunscribes interest. I dont think you have any right to point out to these guys Mr. Bafna. Atleast they are doing their job. If you read the post correctly, they are not promoting the scheme but notifying users not to fall for this one. I am a regular reader here and have read your comments before too. And I am sorry to say this but you’re just trying to promote MTNL whenever and wherever you can. Do you own MTNL or you’re paid to do so? Give yourself and others a space to breathe. PS: Think about it. Respective owner(s) should take note and should ban Mr. Bafna because he is just piggy backing MTNL brand with your name. im not receiving the offer ads properly as before.im Vry dissappointed to hear at offers after it get over.